Counting down the days to the World Cup, who is your favorite team? Have you started doing your homework to make some money betting on the Russia World Cup? If you haven’t, hurry, you have a lot of information to go over, remember betting on your favorite is fun, but It’s not always the best idea, always consider the line. 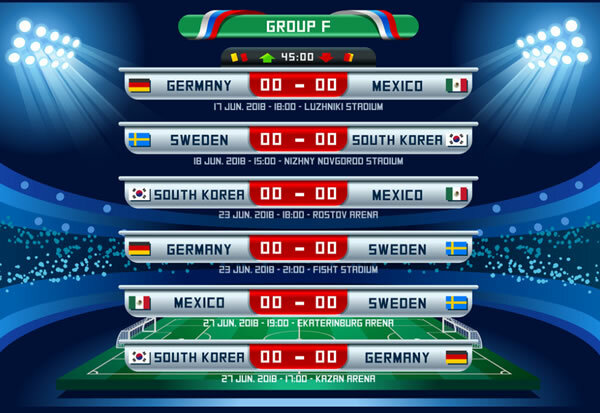 With this in mind, we leave you with information on Group F of the Russia World Cup, formed by Germany, Mexico, Sweden and South Korea. Just as it happens with Group E, where Brazil is a clear favorite, in Group F it’s Germany that takes the leading position; after all, it is one of the favorites to win the World Cup this year. The winners of the 2014 World Cup will be looking to raise the cup again this year and claim their fifth world title. The first thing that comes to mind when we talk Germany, in general, is structured, and the same can be said for their soccer team. Germany has strong, disciplined players that are all about the technique and tactic. They should have no problem classifying to the next stage as the first in their group; their biggest challenge is certainly Mexico, but many men and as a team, the Germans are a better team. Mexicans have a good shot at claiming the second place in their group; historically, the ability of their players and their game plan is good enough to get them at least to the group of sixteen. They don’t have it easy though, Sweden is standing in their way and is a team with enough resources to give Mexico a run for their money. Mexico has experience on their side and a good offensive team. Holding position 24 in the FIFA rankings, Sweden should be able to get past its first match in the world cup against South Korea and battle for the second place in the group with Mexico. Sweden has a team of young and motivated players, conditions that can play in their favor but could also backfire against experienced Mexicans and Germans. The weakest link in the group. South Korea is 57 in the FIFA ranking. Their main problem is their defensive line, and they cannot afford mistakes against teams like Mexico and Germany that have strong and methodic offensive game. Korea has heart, unfortunately, that might not be enough when facing teams that in general have more resources than they do. Certainly, the most exciting game to watch and bet on in Group F will be the Mexico-Sweden match, after going over the odds and the stats for each team, Mexico is our pick to win, and advance in second place of Group F.
Bookies, if you haven’t set up your pay per head service for this World Cup yet, you still have time, head over to AcePerHead.com, the process is simple, the service is great and they offer a huge variety of bets for the World Cup. You can’t miss out on taking all the action possible during the Russia World Cup.